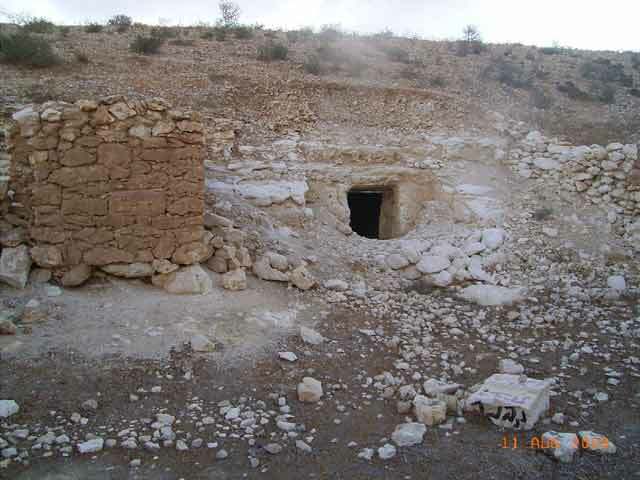 During May 2011, a survey was conducted north of Nahal Duda’im (License No. S-280/2011; map ref. 18000–235/58185–290), prior to preparing the area for planting trees. The survey, undertaken on behalf of the Israel Antiquities Authority and underwritten by the Jewish National Fund, was performed by N.S. Paran and F. Sonntag, with the assistance of S. Gal (GPS). 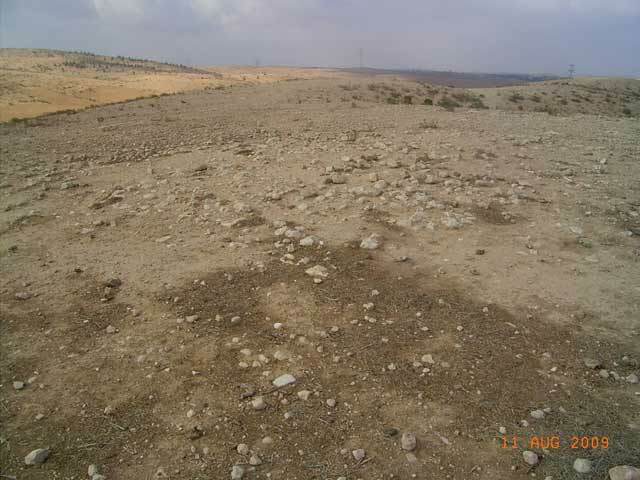 The survey area (c. 2,500 dunams) lies in a region of qirton hills, on the lower western slopes of Giv‘ot Goral and in part of the upper water basin of Nahal Duda’im. Trees were planted in most of the area in the past. Nine sites (1–9; Fig. 1) were documented. 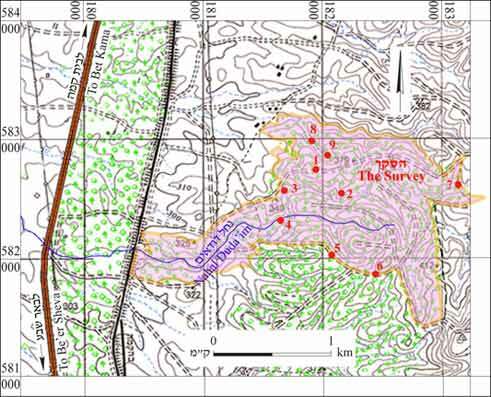 Part of the area was surveyed recently (License No. S-103/2009). 1. Map ref. 181941/582753. A stone building (8×8 m) whose walls are preserved three courses high (0.8 m). Potsherds dating to the Byzantine period were collected at the site. 2. Map ref. 182156/582554. An animal pen (diam. 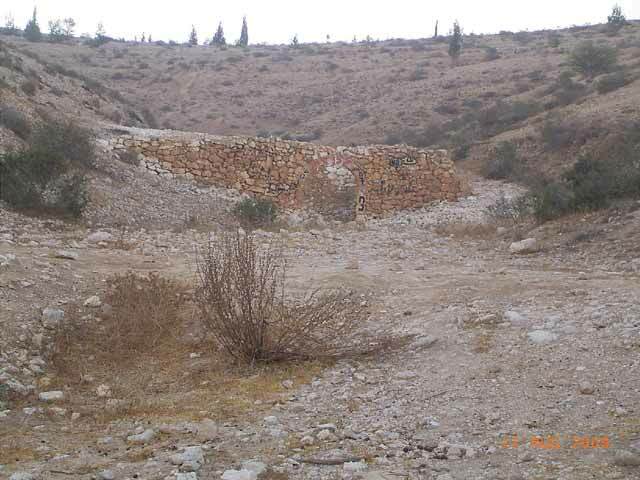 10 m) built of stone and preserved two courses high (0.5 m). 3. Map ref. 181678/582570 (Fig. 2). 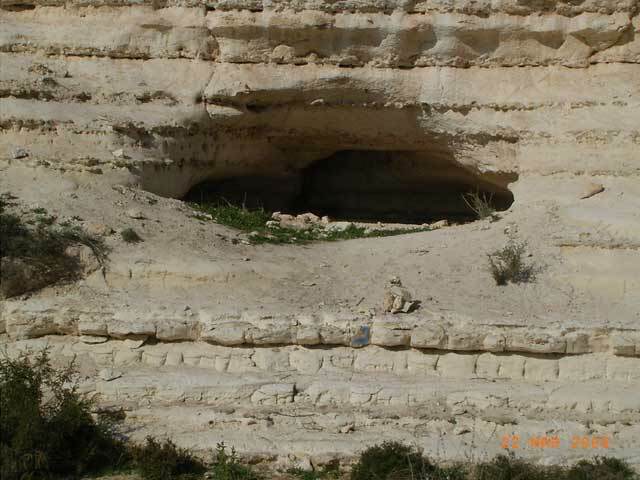 A cave hewn in a qirton outcrop next to the wadi bank of Nahal Duda’im. 4. Map ref. 181643/582322 (Fig. 3). 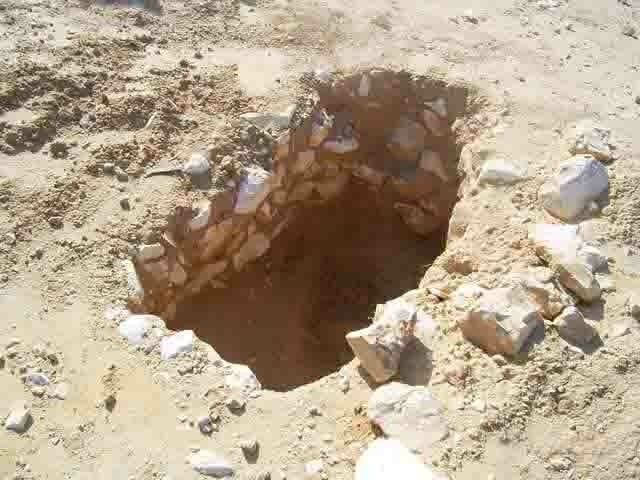 A cist grave (1×2 m) lined with stones that was excavated to its bottom. Several stone concentrations that may represent other graves are evident in the vicinity. 5. Map ref. 182066/582029 (Fig. 4). Remains of a watchman’s hut (3×3 m), built of stones and preserved a maximum of two courses high (0.4 m). 6. Map ref. 182439/581861. A hewn cave dwelling (interior dimensions c. 3×5 m) in which potsherds dating to the Byzantine period were gathered. 7. Map ref. 183140/582620 (Fig. 5). A hewn cave dwelling (interior dimensions c. 5×5 m), around which an open courtyard might have been built. 8. Map ref. 181911/582991 (Figs. 6, 7). A stone-built structure consisting of two rooms and a courtyard (20×20 m). The eastern side of the courtyard utilizes a qirton outcrop in which a cave is hewn. An arched entrance gate is set in the courtyard’s northern wall. Potsherds dating to the Ottoman period were collected at the site. 9. Map ref. 182035/582864 (Fig. 8). 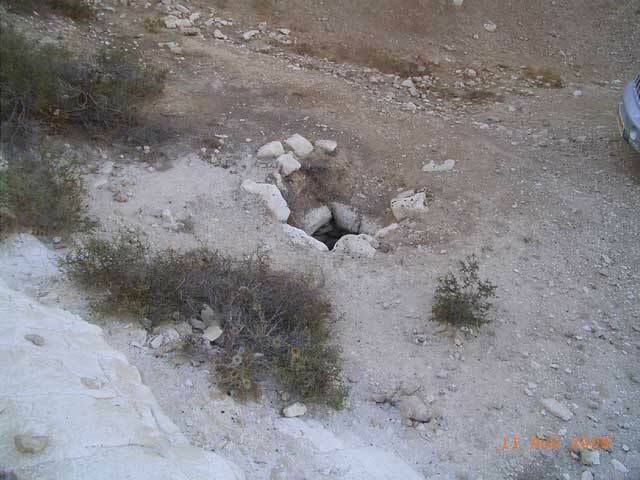 A rock-hewn cistern, whose opening is lined with stones. A dam for diverting water was built south of the cistern. 2. Site 3, cave, looking west. 4. Site 5, watchman’s hut, looking southwest. 5. Site 7, cave dwelling, looking north. 6. Site 8, the northern wall of the courtyard and the arched gate, looking south. 7. 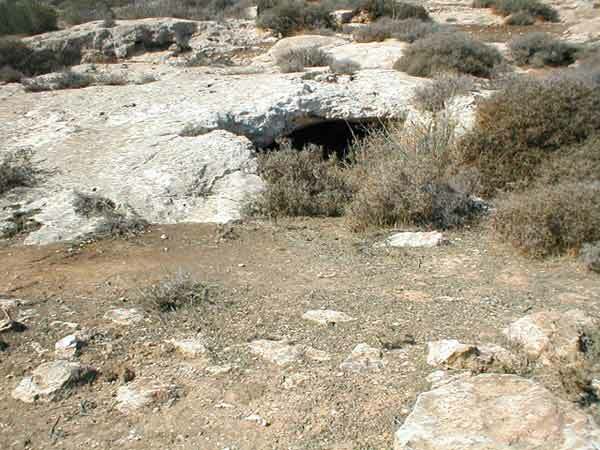 Site 8, the cave and the northeastern room (on the left), looking east.